This article is about the former headquarters of the London County Council and Greater London Council. For the headquarters of the Greater London Authority, see City Hall (London). County Hall (sometimes called London County Hall) is a building in London that was the headquarters of London County Council (LCC) and later the Greater London Council (GLC). The building is on the South Bank of the River Thames, with Westminster Bridge being next to it, heading south. It faces west toward the City of Westminster and is close to the Palace of Westminster. The nearest London Underground stations are Waterloo and Westminster. Today, County Hall is the site of businesses and attractions, including the London Sea Life Aquarium, London Dungeon and a Namco Station amusement arcade. 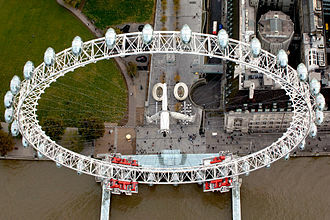 The London Eye is next to County Hall, and its visitor centre is inside the building. There is also a suite of exhibition rooms which was home to the Saatchi Gallery from 2003 to 2006. Other parts of the building house two hotels (a budget Premier Inn & a 5 star Marriott Hotel), several restaurants, the UK headquarters of the company Cloudflare, and some flats. Various spaces are available for hire for functions, including the council chamber at the heart of the building. Until January 2010 the Dali Universe was also in the building but this has now closed and will be reopening in another venue soon. Confirmed in early 2014, the building will become the home of the new Merlin Entertainments attraction and was opening in July 2015. The area is already home to three other Merlin Entertainments attractions. In 2016 London event venue company etc.venues announced plans to open a conference and event space in County Hall. Based on the 4th floor overlooking the Thames, which opened in January 2017. The main six storey building was designed by Ralph Knott. It is faced in Portland stone in an Edwardian Baroque style. The construction, which was undertaken by Holland, Hannen & Cubitts, started in 1911 and the building was opened in 1922 by King George V. The North and South blocks, which were built by Higgs and Hill, were added between 1936 and 1939. The Island block was not completed until 1974. 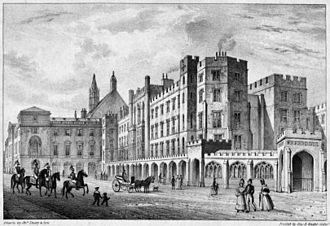 For 64 years County Hall served as the headquarters of local government for London. 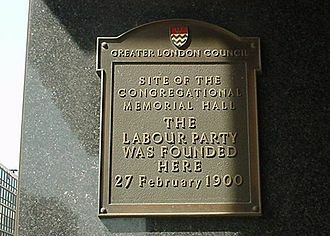 During the 1980s the then powerful Labour-controlled GLC led by Ken Livingstone was locked in conflict with the Conservative government of Margaret Thatcher. Since the Parliament buildings were just across the river from County Hall, the façade of County Hall frequently in more than one year of her tenure served as a billboard for opposition slogans. When the government of Margaret Thatcher abolished the GLC in 1986, County Hall lost its role as the seat of London's government. Talk soon became of what was to happen to the building, and plans to relocate the London School of Economics to the site from its Westminster campus were overruled by Mrs Thatcher, seemingly disapproving of further slogans from students. The building remained in use by the Inner London Education Authority (ILEA) until its abolition in 1990 when the building was transferred to the London Residuary Body and eventually sold to private investors. 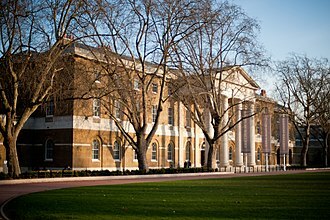 On 21 October 2005, the High Court of England and Wales upheld a bid by the owners of the building, Shirayama Shokusan, to have the Saatchi Gallery evicted on grounds of violating its contract, particularly using space outside of the rented area for exhibits. Today, a large proportion of the building, including the entire fifth floor, remains empty since the dissolution of the GLC. Another small section of the building is occupied as a Premier Inn. The County Hall Island Block, an annex of the main building, was demolished in 2006 to make way for a hotel, the Park Plaza Westminster Bridge. The building, also known as No 1 Westminster Bridge Road, had been disused since 1986 and had become a derelict eyesore. A blue plaque commemorates the LCC, GLC and the Inner London Education Authority at County Hall. etc.venues County Hall conference and event venue. ^ 'General introduction', Survey of London: volume 26: Lambeth: Southern area (1956), pp. 1–17. Date accessed: 28 March 2010. ^ "Saatchi Gallery evicted by judge". BBC News. 21 October 2005. Retrieved 8 December 2008. ^ "Demolition work begins on eyesore". BBC News. 25 May 2006. Retrieved 8 December 2008. ^ "COUNTY HALL A.K.A. THE LONDON COUNTY COUNCIL AND THE GREATER LONDON COUNCIL". English Heritage. Retrieved 6 December 2012. ^ "Namco Funscape London". UK Arcade Racers. Wikimedia Commons has media related to County Hall, London. Westminster is a London Underground station in the City of Westminster. 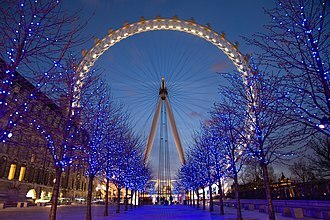 It is served by the Circle and Jubilee lines, on the Circle and District lines, the station is between St. Jamess Park and Embankment, and on the Jubilee line it is between Green Park and Waterloo. It is in Travelcard Zone 1, close by are Downing Street, the Cenotaph, Westminster Millennium Pier, the Treasury, the Foreign and Commonwealth Office, and the Supreme Court. The station was opened as Westminster Bridge on 24 December 1868 by the steam-operated District Railway when the railway opened the first section of its line from South Kensington. It was originally the terminus of the DR and the station cutting ended at a concrete wall buffered by timber sleepers. The approach to the station from the west runs in cut and cover tunnel under the roadway of Broad Sanctuary and diagonally under Parliament Square. 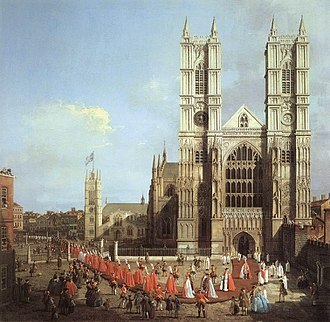 In Broad Sanctuary the tunnel is close to Westminster Abbey and St Margarets church, access to the station was via a passageway from Bridge Street and a pedestrian subway under the road. 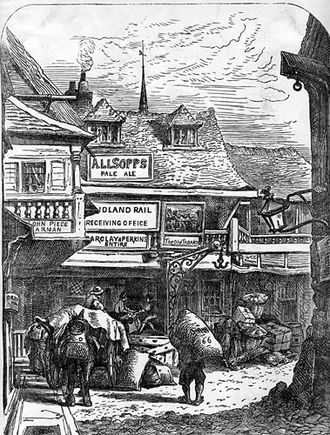 On 30 May 1870, the railway was extended to Blackfriars, on 1 February 1872, the DR opened a northbound branch from its station at Earls Court to connect to the West London Extension Joint Railway at Addison Road. From that date the Outer Circle service began running over the DRs tracks, the service was operated jointly by the H&CR and the DR. On 30 June 1900, the Middle Circle service was shortened to terminate at Earls Court, and, on 31 December 1908, as part of efforts to improve competitiveness, the DRs tracks were electrified during 1905 and new electric rolling stock was brought into use. In 1907, the station was given its present name, Westminster, by the mid-1890s the station entrance had been incorporated into a larger building. These were the first of many projects by the architect for the London Electric Railway, in 1949, the Metropolitan line-operated Inner Circle route was given its own identity on the tube map as the Circle line. Between late 1962 and early 1964 the east ends of the platforms were extended to allow longer 8-car trains to be operated and this involved carefully enlarging the tunnels under the Metropolitan Polices original headquarters at New Scotland Yard. Hotel ratings are often used to classify hotels according to their quality. The development of the concept of rating and its associated definitions display strong parallels. From the initial purpose of informing travellers on basic facilities that can be expected, today the terms grading and classification are used to generally refer to the same concept, that is to categorize hotels. There is a variety of rating schemes used by different organizations around the world. Many have a system involving stars, with a number of stars indicating greater luxury. Forbes Travel Guide, formerly Mobil Travel Guide, launched its star rating system in 1958, the AAA and their affiliated bodies use diamonds instead of stars to express hotel and restaurant ratings levels. Food services, view, room variations such as size and additional amenities and fitness centers, ease of access, Hotels are independently assessed in traditional systems and rest heavily on the facilities provided. In recent years hotel rating systems have criticised by some who argue that the rating criteria for such systems are overly complex. It has been suggested that the lack of a global system for rating hotels may undermine the usability of such schemes. The more common classification systems include star rating, letter grading, from A to F, systems using terms such as Deluxe/Luxury, First Class/Superior, Tourist Class/Standard, and Budget Class/Economy are more widely accepted as hotel types, rather than hotel standard. Some countries have rating by a single public standard—Belgium, Greece, Malta, Portugal, the Swiss hotel rating was the first non-government formal hotel classification beginning in 1979 It influenced the hotel classification in Austria and Germany. The formal hotel classification of the DEHOGA started on August 1,1996 and this implementation influenced the creation of a common European Hotelstars rating system that started in 2010. In France, the rating is defined by the public tourist board Atout France using a system which has changed to a five-star system from 2009 on. In South Africa, the Tourist Grading Council of South Africa has strict rules for a hotel types granting up to 5 stars, in India, the classification of hotels is based on two categories such as Star and Heritage. Waterloo is a London Underground station located within the Waterloo station complex that incorporates both the tube station and the main line railway station. It is the busiest station in Great Britain, with in excess of 99 million passenger entries and it is served by four lines, the Bakerloo, Jubilee and Waterloo & City lines. The station is situated in fare zone 1 and is located near the South Bank of the River Thames and its within walking distance to the London Eye. The first Underground Line at Waterloo was opened on 8 August 1898 by the Waterloo & City Railway, a subsidiary of the owners of the line station. 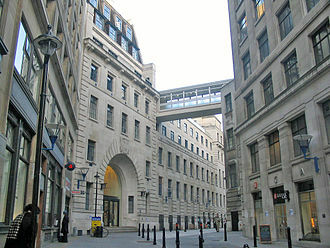 The W&CR, nicknamed The Drain, achieved in a way the L&SWRs original plan of taking its tracks the short distance north-east into the City of London. On 10 March 1906, the Baker Street & Waterloo Railway was opened, on 13 September 1926, the extension of the Hampstead & Highgate line was opened from Embankment to the existing City & South London Railway station Kennington with a new station at Waterloo. The London Dungeon is a tourist attraction in London, which recreates various gory and macabre historical events in a gallows humour style. It uses a mixture of actors, special effects and rides. Opening in 1974, the attraction was designed as a museum of macabre history. The Dungeon is operated by Merlin Entertainments, in 2013, the London Dungeon moved from its premises on Tooley Street to a new location in County Hall next to the London Eye. The London Dungeon features 18 shows,20 actors and 3 rides, visitors are taken on a journey through 1000 years of London’s history where they meet actors performing as some of London’s most infamous characters, including Jack the Ripper and Sweeney Todd. The Dungeon’s shows are staged on sets with special effects. The show incorporates events such as the Black Death and the Gunpowder Plot, and includes such as The Torturer, The Plague Doctor. Guests are encouraged to participate in the shows, the experience includes a drop ride to doom, a free-fall ride staged as a public hanging. The London Dungeon was founded in 1974 by Annabel Geddes and it was initially designed as a museum of macabre history depicting gory scenes. Early characters included Boudicca, Mary Tudor and Thomas Beckett and had scenes from the Norman Conquest, over the years the Dungeon has changed into an actor-led, interactive experience with both humorous and light horror elements. London’s first ever indoor water ride was installed at the venue in 1997, kunick Leisure Group owned The Dungeons company during the 1980s, before it was bought by Vardon in 1992. In 1999 Vardon became the Merlin Entertainments Group following a management buyout led by Nick Varney, on 31 January 2013, the London Dungeon closed its doors after 39 years at Tooley Street, London Bridge. The attraction moved to London’s County Hall on the South Bank, the original London Dungeon opened in 1974 as a gory horror museum that showcased historical events. The museum was a free flow attraction and featured models and animatronics to showcase its scenes,1997 saw the arrival of Judgment Day, Sentenced to Death which saw visitors tried in a courtroom. She was the longest-serving British prime minister of the 20th century, and the first woman to have held the office. A Soviet journalist dubbed her The Iron Lady, a nickname that became associated with her uncompromising politics, as Prime Minister, she implemented policies that have come to be known as Thatcherism. A research chemist before becoming a barrister, Thatcher was elected Member of Parliament for Finchley in 1959, Edward Heath appointed her Secretary of State for Education and Science in his 1970 government. In 1975, Thatcher defeated Heath in the Conservative Party leadership election to become Leader of the Opposition and she became Prime Minister after winning the 1979 general election. Her political philosophy and economic policies emphasised deregulation, flexible labour markets, the privatisation of state-owned companies and she narrowly escaped an assassination attempt in 1984. Thatcher was re-elected for a term in 1987. During this period her support for a Community Charge was widely unpopular and she resigned as Prime Minister and party leader in November 1990, after Michael Heseltine launched a challenge to her leadership. After retiring from the Commons in 1992, she was given a peerage as Baroness Thatcher which entitled her to sit in the House of Lords. After a series of strokes in 2002, she was advised to withdraw from public speaking. Despite this, she managed to pre-record a eulogy to Ronald Reagan prior to his death, in 2013, she died of another stroke in London, at the age of 87. Always a controversial figure, she has described as one of the greatest and most influential politicians in British history. 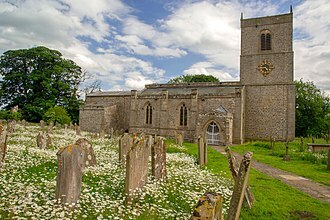 Thatcher was born Margaret Hilda Roberts on 13 October 1925, in Grantham and her father was Alfred Roberts, originally from Northamptonshire, and her mother was Beatrice Ethel from Lincolnshire. She spent her childhood in Grantham, where her father owned two grocery shops, Prior to the Second World War, in 1938 the Roberts family gave sanctuary to a teenage Jewish girl escaping Nazi Germany. Thatcher was to describe this in her memoirs as among the significant events of her formative years, Alfred Roberts was an alderman and a Methodist local preacher, and brought up his daughter as a strict Wesleyan Methodist attending the Finkin Street Methodist Church. He served as the Member of Parliament for Brent East from 1987 to 2001. A suspended member of the Labour Party, he was on the hard left. Livingstone was heavily criticised in the media for supporting controversial issues like republicanism, LGBT rights, and a United Ireland. Livingstone was an opponent of the Conservative Party government of Prime Minister Margaret Thatcher. Elected as MP for Brent East in 1987, he closely associated with anti-racist campaigns. He unsuccessfully stood for Labour Party leader on a leftist platform in 1992 and 1994, after failing to become Labours candidate in the 2000 London mayoral election, Livingstone successfully contested the election as an independent candidate. 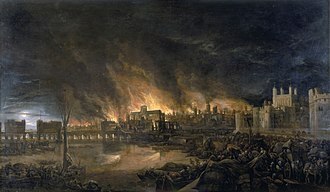 In his first term as Mayor of London, he introduced the congestion charge, Oyster card, and articulated buses and he stood unsuccessfully as Labour candidate in Londons mayoral elections of 2008 and 2012, losing both to the Conservative candidate Boris Johnson. 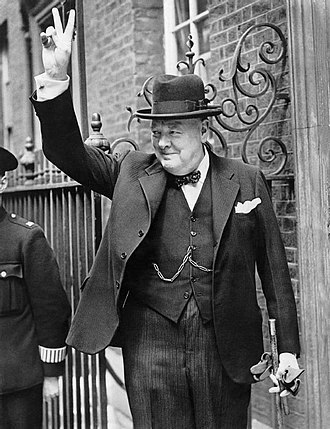 Characterised as the truly successful Left-wing British politician of modern times. Livingstone was born in his grandmothers house in Lambeth, south London, on 17 June 1945. His family was working class, his mother, Ethel Ada, had born in Southwark before training as an acrobatic dancer. Kens Scottish father, Robert Bob Moffat Livingstone, had born in Dunoon before joining the Merchant Navy in 1932. Having first met in April 1940 at a hall in Workington. After the war the couple moved in with Ethels aggressive mother, Zona Ann, Livingstones sister Lin was born 2 1⁄2 years later. 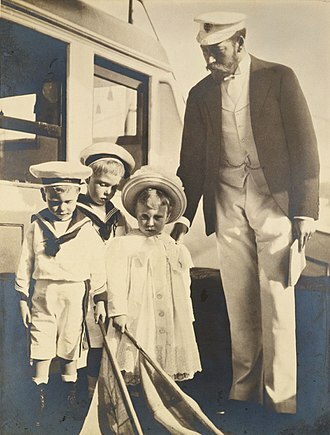 Livingstones parents were working class Tories, and unlike many Conservative voters at the time did not hold to socially conservative views on race and sexuality, opposing racism, the family was nominally Anglican, although Livingstone abandoned Christianity when he was 11, becoming an atheist. In 1957, his family purchased their own property at 66 Wolfington Road, rather shy at school, he was bullied, and got into trouble for truancy. One year, his master was Philip Hobsbaum, who encouraged his pupils to debate current events. Port of Liverpool Building (built 1907). The War Office in Whitehall, London (built 1906). The Auckland Ferry Terminal in Auckland, New Zealand (built 1912). 53 King Street, built for Lloyds Bank during 1915. Premier Inn Waterloo, London, 2016. Azam preparing his canvases on an ice desert in Antarctica. Entrance to the old London Dungeon building.